Recognizable images contain within themselves other unnamed and unnameable images. These can be found in the same way that images appear when staring long into clouds. Blackout drawings are an aid to this kind of finding, beginning with the illusions of photographs. Here are two illustrations of how this works: one a “white-out” text (right), the other a blacked-out photograph (above). 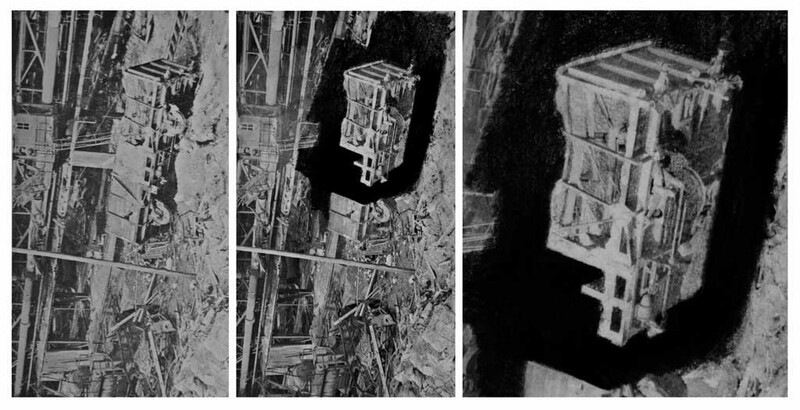 The larger blackout drawings that follow, below, are made by blacking-out photocollages – a particularly potent combo. This technique is a discovery (and for me a revelation); a way of making automatic, or semi-automatic drawings where the author’s job is to find rather than to invent; to see things you did not know, and to draw only what you see — or seem to see. These images arrive with the affect of an irrefutable argument.